Earlier today, I published a post in which I mentioned that I had placed a wager on Braun Strowman in Sky Bet's 'United States Champion After Samoa Joe' market. At the time of the post, Joe was 8/1. He has since been cut into 4/6. I finished the aforementioned post stating that I'd cover the new Sky Bet markets that came out last week following WrestleMania 35 now that they've been adjusted following the Superstar Shakeup. So, here goes.. The selection that stands out - so far - in the market for Seth Rollins' Universal Championship successor is Drew McIntyre. You'll see, by clicking on the image below, that he was 12/1 when I first came across the market a couple of days after Mania. His price has dropped all the way down to 2/1. AJ Styles - who is now even more eligible to succeed Rollins as they're now both on the same brand - was 16/1 last week, but is now a 3/1 favourite. Following Roman Reigns' move from Raw to Smackdown, his selection went out to 20s from 8/1 but - as of this evening - his price is down to 16/1. Samoa Joe is another selection that has shortened since yesterday. After moving out from 22/1 to 50/1 he has now been snipped into 33/1. This is from a small wager I placed on Joe as I've more or less written off his chances of keeping the US Championship and thought it was worth a punt on him eventually winding up with the red strap. The big story coming out of this week's shakeup was Roman Reigns' move from Raw to Smackdown. 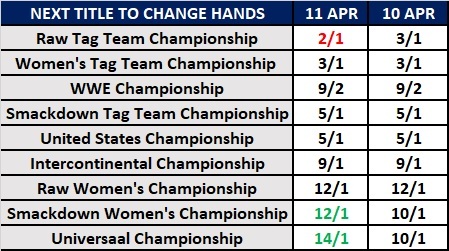 As a result of this switch, the bookies went from offering Reigns at double figures to 3/1 favourite to succeed Kofi Kingston for the WWE Championship. The market is unchanged from yesterday's post-shakeup update, so you can view how the other selections moved by clicking on the image below. Lacey Evans has remained a 4/1 favourite to be the next WWE Raw Women's Champion in the market in which customers can place wagers on Becky Lynch's successor for the red brand's title. 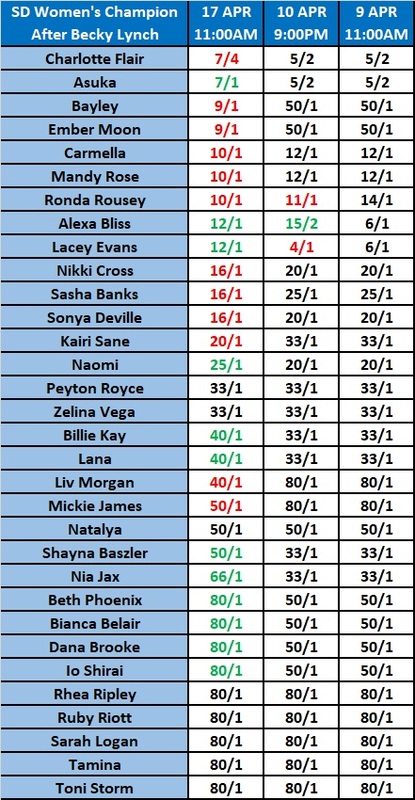 Former champ, Ronda Rousey, was moved from 6/1 to 4/1 within the first day. She remains at this price post-shakeup. 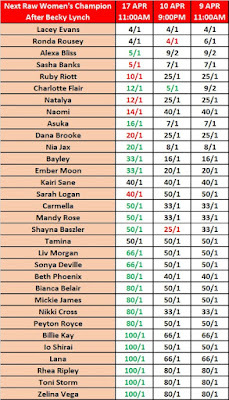 Other selections to move in following Monday and Tuesday were Sasha Banks (7/1 to 5/1), Ruby Riott (25/1 to 10/1), Natalya (25/1 to 12/1), Naomi (40/1 to 14/1), Dana Brooke (25/1 to 20/1) and Sarah Logan (50/1 to 40/1). Charlotte Flair went from 5/2 into 7/4 in the market to succeed Lynch for the Smackdown Women's Title. Asuka, who was also 5/2 last week, has drifted out to 7/1. There's a good reason why - she looks destined to be in the tag division for the time being. Two of Smackdown's latest signings - Bayley and Ember Moon - have both moved in from 50/1 into 9/1 each. Other selections to lower since the TVs are: Carmella (12/1 to 10/1), Mandy Rose (12/1 to 10/1), Ronda Rousey (was 14/1 on April 9th, moved to 11/1 on April 10th but ow 10/1), Nikki Cross (20/1 to 16/1), Sasha Banks (25/1 to 16/1), Sonya Deville (20/1 to 16/1), Kairi Sane (33/1 to 20/1) Liv Morgan (80/1 to 40/1) and Mickie James (80/1 to 50/1). With Finn Balor moving over to Smackdown from Raw, there has been a major update to the market. A lot of the Raw roster, who were in the running before Balor's move, have been taken off the board while Smackdown talent have been added. 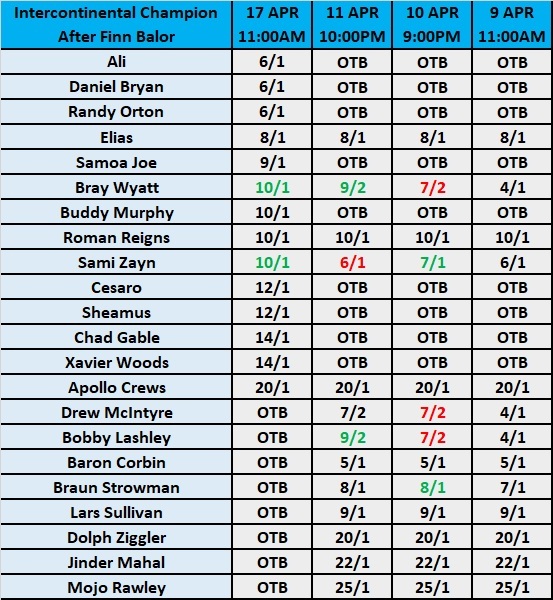 The most notable are Ali, Daniel Bryan and Randy Orton who are all available at 6/1 each. Following their WWE Smackdown Tag Team Championship loss to Matt and Jeff Hardy, The Usos were added to the 'Raw Tag Team Championship After Curt Hawkins and Zack Ryder' market at 4/1. They were then cut to 3/1 and were 5/2 on ahead of Monday's Raw. When the market was republished on Wednesday - and obviously after Jimmy and Jey were officially named as Raw signings - they were moved down to 11/10. NXT's Tag Team Champions - The War Raiders The Viking Experience - were also brought up to Raw on Monday night. The team was already available ahead of their call-up at 14/1, but was 7/2 yesterday and is now down to 3/1. 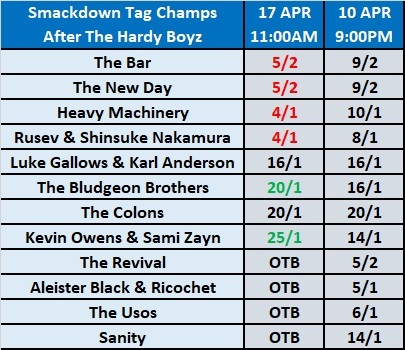 The Bar and The New Day were 9/2 to succeed Matt and Jeff Hardy when the market was published a day following the Hardys' win over The Usos on last week's Smackdown. They have since moved in to 5/2. 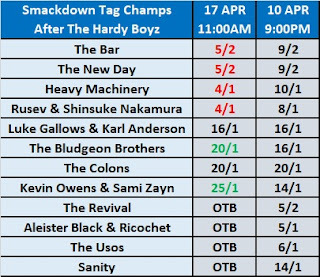 Heavy Machinery, who were officially announced as Smackdown talent this week, have been cut from 10/1 into 4/1. Rusev and Shinsuke Nakamura, who were still a tandem on TV this week, have had their odds halved from 8/1. On Tuesday's Smackdown, Paige revealed the team she had lined up for The IIconics were Asuka and Kairi Sane. They were instant favourites when the 'Champs After The IIconics' market was published on Wednesday. Another team that has shortened since Tuesday is Mandy Rose and Sony Deville. Their selection was initially 5/1 on April 9th, but drifted to 6/1 the following day. 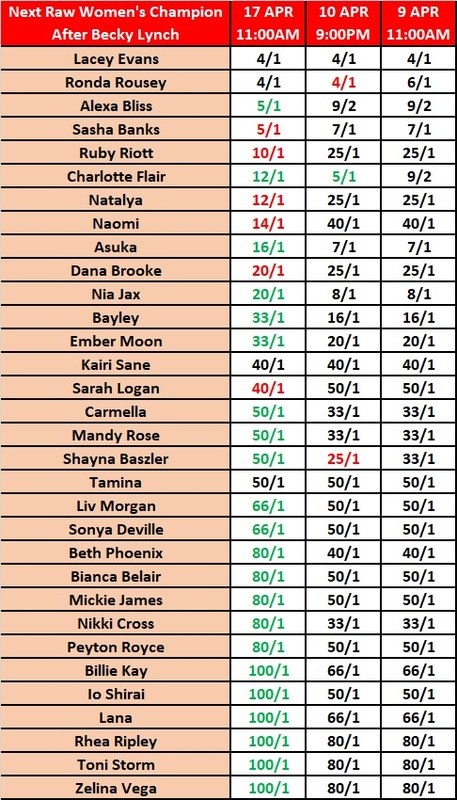 This was likely due to punters assuming that Paige's team would be Kairi Sane and Io Shirai as their price was snipped from 8/1 into 3/1. The Sane and Shirai selection went all the way down to 6/4 before the market was closed ahead of TVs and is now off the board following the pairing of Shirai and Asuka. All the prices mentioned in this post were correct as of 7PM BST this evening. I have just had a gamble on Sky Bet's 'United States Champion After Samoa Joe' market. The selection I've gone for is a person who is currently not on the same roster as Joe - Braun Strowman. I've placed the bet because Joe and Strowman had an altercation on TV last week. As noted, both are on opposing brands, but - according to reports - Joe was meant to appear on this week's Raw as a new signing from Smackdown but was unwell and he did not make an appearance on the show. Nor did he appear on Smackdown. However, Finn Balor - who is a fellow secondary titleholder as Intercontinental Champion - did. With both the IC and US Title currently on the blue brand, I strongly believe that Joe was meant to move over before to Raw before he took ill on Monday, so I'm gambling on him making the move over and entering a feud with the person he had beef with on last week's edition of Smackdown. 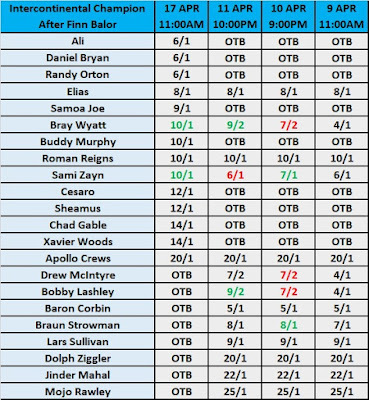 Strowman was not a selection when I made a personal note of the odds yesterday morning. I have backed him at 10/1. He's now down to 8/1. By the way - I will cover Sky Bet's 'Champion After' markets over the next day or so. They've had a number of obvious changes made to them now that the rosters have been shaken up. It was interesting to see Ronda Rousey announce that she was taking an - and I cannot believe I am going to write the next few words - 'Impregnation Vacation' with her husband, Travis Browne, in an Instagram picture that was published yesterday. It was intriguing not only because Dave Meltzer could now be vindicated for a report he wrote months ago that stated Rousey was likely to take time away from WWE following WrestleMania 35 to start a family but also because of the date the post was published. If you recall, I pointed out at the start of the month that BetOnline had published a prop market in which customers could bet whether or not 'Ronda Rousey announces a break from WWE'. The now controversial part of the market is that the announcement had to have been made by today. Ronda obviously didn't straight up announce that she was taking a break from WWE, but yesterday's Instagram post sure did tease that she was about to take a hiatus. Seeing as I wrote back at the start of the month that I didn't think Rousey would announce any sort of departure from WWE before April 16th, and am now unsure whether the Instagram post can be considered as an announcement, I asked a British bookmaker how he would settle the market if he were in charge of it. He feels that the 'No' would be the right call in this situation because there wasn't a clear - and official - announcement made by Rousey via proper channels. He also stated that he would have settled in favour of the 'Yes' if WWE had made some sort of official announcement on its platforms. Seeing as neither has happened by today, his call would have been to settle with 'No' as the winning selection. Speaking of Ronda, how's this one for a plot twist? Vince McMahon has announced that - on tonight's edition of Smackdown - the 'biggest acquisition' in the show's history will be unveiled. On the surface, you'd assume it's Roman Reigns. But, what if it's Ronda? Over the past day, I've published a few posts about Kambi's Wrestling Observer Newsletter star ratings betting markets for NXT TakeOver: New York and WrestleMania 35. In this final part, I'll take a look over two other kinds of markets that were available to customers leading into the event. They are head-to-head specials and prop bets. In head-to-head - or matchbet - wagering, the customer is given two matches and they have the option to bet on which of the two receives the most stars in Dave Meltzer's review of the event. A third selection is also there to cover both matches possibly getting the same number of stars. Kambi published three versions of these specials for WrestleMania. When Kambi put AJ Styles .vs. Randy Orton up against the Roman Reigns .vs. Drew McIntyre match up, the company had the former as a 19/20 favourite. And, going by the wagering, the customers thought it was a rightful fave as it was cut into 10/11 by April 3rd and was then snipped to 4/5 on the night of the event. The bettors were spot on. AJ Styles versus Randy Orton received three-and-a-quarter stars while its opposition was graded two. When first published, the market which had the no holds barred match up against the one with falls count any rules had Triple H .vs. Batista open as an 11/25 favourite. The McMahon versus The Miz match was 11/5. The customers evidently sided with the falls count anywhere contest as it was the selection that fell the majority of the time that the market was available. By the end, the two markets were at 19/20 and the 'Same Star Rating' option, which started off at 41/20. was 9/4. The result was a win for Triple H .vs. Batista. It was given two stars. Shane and The Miz failed to match it by a quarter. Brock Lesnar's Universal Championship loss to Seth Rollins was awarded three-and-a-half stars. It was paired off with the main event, which had three stars. You'll see, by clicking the table below, that the eventual winner began to drift out on March 26th and closed at 11/4. It was initially 5/4 on March 2nd. Kambi also published a handful of Observer-themed prop bets for the PPV. Most offered a 'Yes' or 'No' option, but two specials only allowed 'Yes'. I'll get to those first and then go through the.. err.. proper prop bets. The bookies were offering 2/1 that the highest rated match on the WrestleMania 35 card would have more stars than anything that was graded in Meltzer's review of NXT TakeOver: New York. As I mentioned in one of yesterday's posts, Johnny Gargano's win over Adam Cole in the main event was given five-and-a-half stars. The highest rated match at Mania - Daniel Bryan .vs. Kofi Kingston - came a star short from tying let alone beating it. Better Than ROH/NJPW G1 Supercard? 4/1 was being offered on the highest rated WrestleMania match beating the best match - or matches - on the Ring of Honor and New Japan show that took place from Madison Square Garden the night before. The only match that beat Kofi's title win was the main event, which saw Kazuchika Okada claim the IWGP Heavyweight Championship from Jay White. It received four-and-three-quarters. There was another 'Better Than' special, but this did give customers the option to wager on the 'No', so I've included it in the prop bet coverage below the image of the prop market titles and how their odds were adjusted leading into the event. The proposition market titled 'Better Than WrestleMania 34?' was similar to the above two markets in that the customer had to bet whether one of the matches on the WrestleMania 35 card would perform better than any on another card. This time, however, the customers were wagering on the highest rated match at this year's WrestleMania doing better than the one from 2018. The customers were able to bet 'No' on this. It opened at 7/5 while the 'Yes' was 1/2. The match that had to be beaten was Ronda Rousey and Kurt Angle .vs. Triple H and Stephanie McMahon, which was given four-and-a-quarter in Meltzer's review of WrestleMania 34. 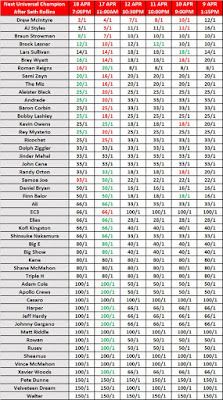 With Kofi Kingston's win over Daniel Bryan getting a quarter more than that, the winning selection was the favourite. As you can see, the consensus agreed this year's highest rated match would beat last year's. The odds were moved to 1/3 from 2/5 on the night of the event. The market titled 'Curtain Raiser' allowed punters to bet whether or not the first match on the main card would turn out to be the highest rated match on the card. It turned out to be Brock Lesnar .vs. Seth Rollins which - in a way - had the potential to do well. The winning selection was obviously 'No'. It opened at 1/6 and was last seen by yours truly at 1/5 in the afternoon of April 6th. I surmise the reason why it was taken off the board is due to reports that AJ Styles versus Randy Orton - another match that had potential on paper to get the most stars - was scheduled to be the main card opener. 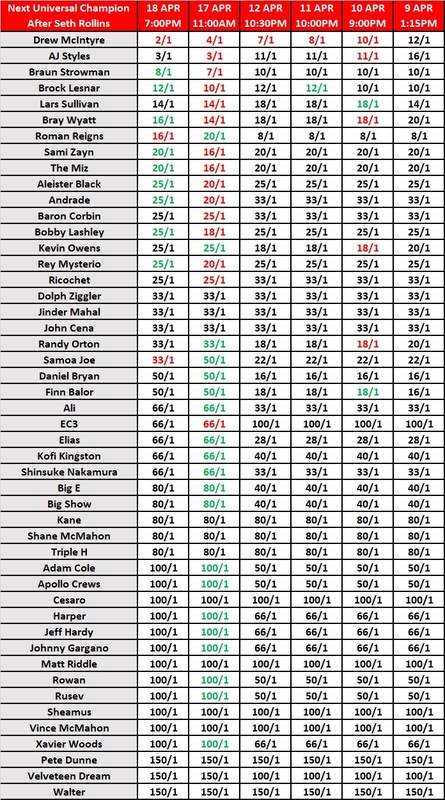 The prop titled 'Join-Winners' was an opportunity to wager on or against there being two or more matches with the highest amount of stars in Meltzer's review. With Bryan .vs. Kingston being the only match with the highest number of stars, the winning selection was once again the 'No'. It was 1/2 to start off with before falling to 11/25, but managed to drift back up to its earlier price by Sunday evening. I had a bet on this market, but I went the wrong way. I backed 'Yes' when it was 7/5 on March 15th. I felt that, with a card filled with tons of matches, there was a strong chance that there would be a tie when it comes to matches with the highest star ratings. The 'Pre Show' proposition was for any of the matches on the pre-show to be given the highest star ratings in Dave Meltzer's review. Unsurprisingly, the bookies had the eventual winner - 'No' - a very short 2/13 when I came across the market on March 16th. It was down to 1/12 by April 3rd and remained that way right up until the close. The 'Title Match' prop was for any match 'valid for any championship' would be awarded the most stars in the review. With Bryan .vs. Kingston obviously being for the WWE Title, this was a win for those who may have backed 'Yes'. 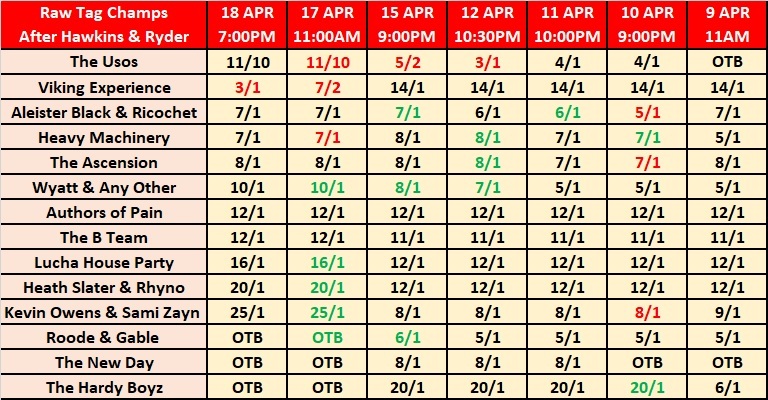 And, if you look at the table above, it looks like many did as the selection opened at 1/8 on March 16th, was backed into 1/10 by March 20th and fell into 1/12 a week after that. It closed at a mildly higher 2/13 after the 'No' was cut from 5/1 into 7/2 in early April. Finally, the market titled 'Women' was available for customers to bet a women's match receiving the most stars in Meltzer's review. With the main event and the battle royal only being eligible, it was safe to conclude that - for it to win in favour of 'Yes' - the main event had to be the match of the night. You'll see the consensus went with the 'Yes' as it fell from its opening 19/10 to 5/4. The 'No' remained a favourite throughout, but it drifted to 11/20 from 7/20 over the three weeks it was available. I'll return to the Observer specials next month if Kambi releases anything for Money in the Bank 2019. In the most recent post, I went through the Wrestling Observer star ratings markets that Kambi published for this past weekend's NXT TakeOver: New York event to see how they were settled now that Dave Meltzer's review of the show has been published. It's now time to take a look over the WrestleMania 35 Over/Under markets. Tony Nese's win over WWE Cruiserweight Champion - Buddy Murphy - was given three-and-a-half stars by the newsletter editor. The bookmaker had the line spot on. Those who bet on this market would have found 'Exactly 3.5 Stars' at 39/20 in the earlier stages or 43/20 right up to the match. You can see, by the betting, that the punters appeared to have backed the bout hitting the 'Under' as the odds went from 17/20 to 3/4. Meltzer graded the match higher as it had two-and-a-quarter stars, so the 'Over' was the winning selection. The line for The Revival versus Zack Ryder and Curt Hawkins was set very low at one star. As I wrote when it was first published a week ago, I was initially surprised at the one star line but then I surmised it was set in this way because the oddsmaker thought the match would be short. Despite understanding why the line was short, I felt it was far too low so went high. You'll see - in the table below - I wasn't the only one. The selection was 9/10 to start off with but, by Sunday morning, had been cut to 4/6. Those who took the 'Over' would have had their bets settled as winners as the reviewer gave the match three stars. The bookmaker's estimate for the Andre the Giant Memorial Battle Royal was exactly what Meltzer ended up grading it: one-and-a-half stars. The winning selection was 21/10 right through to just before the market was taken down ahead of the bell. Seth Rollins' WWE Universal Championship victory over Brock Lesnar was graded three-and-a-half stars in Meltzers review. The bookmakers set the line at 4.25 in mid-March. I correctly sided with the 'Under' as the line was a half star higher than I guessed it would be. It seems the consensus also felt the line was high as it was a slightly shorter 4/5 by April 3rd. The O/U market for AJ Styles .vs. Randy Orton opened on March 15th with the line set at 4 stars. The 'Under' descended from EVS to 7/10 between then and a couple of hours beforehand. Those who sided with the bout getting under four stars were spot on as the editor gave the match three-and-a-quarter stars. The Usos' successful Smackdown Tag Team Championship defence in a fatal four-way match followed. The line was set at three stars when betting opened on April 5th. The price remained unchanged right up to the start of the match with the 'Over 3 Stars' at 13/10, the 'Under' at 7/10 and 'Exactly 3 Stars' was 43/20. Meltzer gave the bout three-and-three-quarters, so the 'Over' turned out to be the right play. Kambi set the line for the falls count anywhere match between The Miz and Shane McMahon at 3.25 Stars. 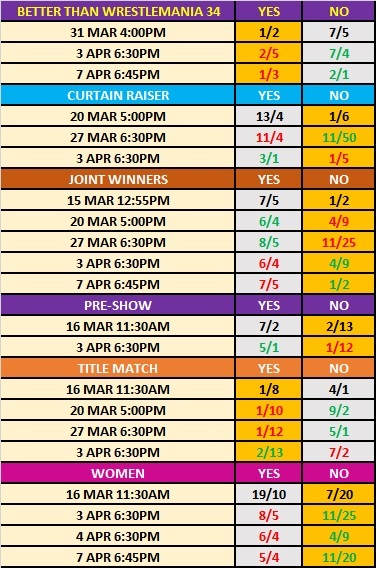 You'll see below that the gamblers backed the 'Under' from 13/10 to 13/25 between March 15th and the night of the show. The punters were on the right side. Meltzer gave the match one-and-three-quarters. Despite the line for the WWE Women's Tag Team Championship match being set at a low 2.25, the match still fell under that as Dave Meltzer gave it one-and-a-quarter. Going by how the odds changed, the consensus appeared to have backed the winning option as it was lowered from 4/5 into 13/20. As covered in this morning's post, Kofi Kingston's WWE Championship win over Daniel Bryan was the Highest Rated Match of the Night. It received four-and-a-half stars in the review. Kambi set the line at four stars when the market was first published on March 27th. However, by April 3rd, the price for the 'Under' had moved in from 4/5 to 7/10. The winning selection was 5/4 to begin, but was a slightly higher 13/10 between April 3rd right up to the night the market closed. Samoa Joe's one-minute submission win over Rey Mysterio in the US Championship match was not graded by Meltzer. Therefore, wagers were voided. For what it's worth, the punters felt the line of 3.5 was too high and backed the 'Under' from 3/4 into 1/2. The oddsmakers set the line for Roman Reigns .vs. Drew McIntyre at four stars when the market was installed on March 26th. The 'Under' came in from 17/20 into 8/13 between then and the night of the show. Those who backed the 'Under' made the correct call. Their bets will be settled as winners because the final result was two stars. Another two star match was the no holds barred meeting between Triple H and Batista. When the line was first made available, Kambi had it at 3.75. The punters immediately took to backing the 'Under' as it dropped from 21/20 to 4/5 within its first day. The fall continued right up until the night of the show where the eventual winner was 1/2 before the market closed. Kambi's line for Kurt Angle's farewell match was two stars to begin with. 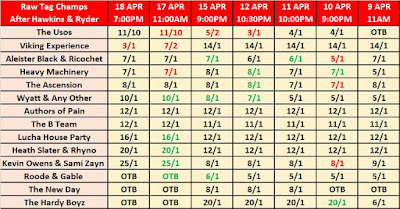 However, by April 3rd - and following the 'Under' plummeting from 17/20 into 13/25 - the bookies reset the line to one star. From there, the gamblers appear to have sided with the 'Over' as went to 33/20 to 17/20. I was one of the punters who was reluctant to bet with the line at two. This is because I had guessed the line would be two and I like betting over or under my prediction versus the bookmaker's. As soon as it was moved to one - a full star below my guess - I took a punt on the 'Over'. And I came up short. Meltzer gave the match exactly one star. So, those who took the 'Under 2 Stars' were on the correct side but those who backed the Over at the adjusted line would have had their bets settled as losers. Kambi set the line for Finn Balor's WWE Intercontinental Championship challenge against Bobby Lashley at 2.75. As the table shows, the 'Under' fell from 23/20 into 19/20 between March 27th and April 3rd. The market remained that way right up to Sunday night. Those who backed the 'Under' were on the right side as Meltzer graded the match one-and-a-quarter stars. Kambi set the Over/Under for the main event at 4.25 stars. The action appeared to have went the way of the 'Over' as the selection went from 19/20 on March 15th to 7/10 by April 3rd. It was cut to 13/20 on the night of the show. The match fell short of Kambi's line as Meltzer gave it three stars. Therefore, the best bet would have been the 'Under' with prices of 11/10, 13/10 or - if you had waited until late - the top price of 6/4. In future posts, set for later this weekend, I'll take a look over the Observer matchbet/head-to-head and prop bets that were available for the PPV.